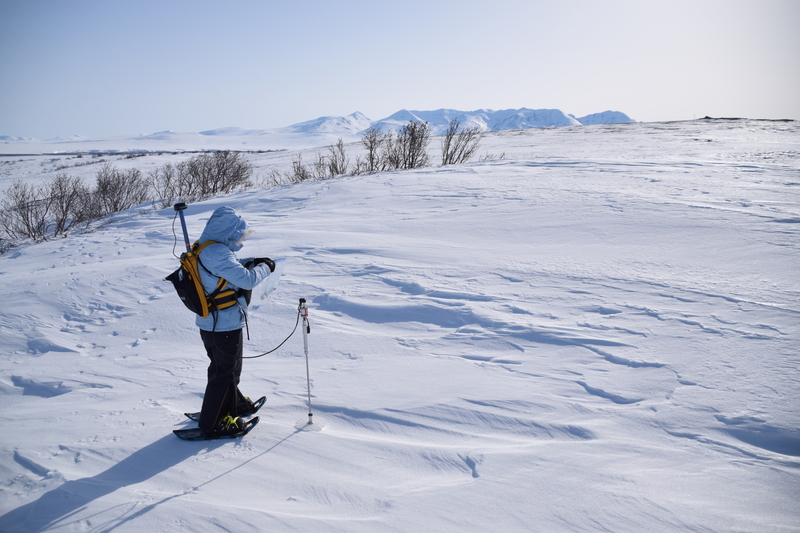 For the past six years, some 140 scientists from five institutions have traveled to the Arctic Circle and beyond to gather field data as part of the DOE-sponsored Next-Generation Ecosystem Experiments Arctic or NGEE Arctic project. The research teams integrate this data into Earth system models to improve predictions of environmental change. Stan Wullschleger, director of ORNL’s Environmental Sciences Division, leads the NGEE Arctic project, orchestrating a flow of scientific teams journeying to Utqiagvik and Nome, Alaska, to gather measurements. The 10-year project draws on expertise in diverse disciplines such as hydrology and biogeochemistry from researchers at Oak Ridge, Los Alamos, Brookhaven and Lawrence Berkeley national laboratories and the University of Alaska–Fairbanks. We talked with Wullschleger about the discoveries and challenges of the NGEE Arctic project. This is an edited transcript. Why go to the Arctic Circle? The Arctic is an important region for investigating the interactions between land and atmospheric processes and how these feedbacks affect climate. The Arctic is warming at a rate twice that of the global average, and the consequences of this warming will shape the ecology of this region in many ways. Changes in environmental processes like carbon cycling and shrub migration are being accelerated in the Arctic more than anywhere else on the planet. Our goal is to measure it, translate data into equations, and incorporate those into computer models. Arctic soils also hold a significant amount of stored carbon. We are inter- ested in the sensitivity of these very ice- rich ecosystems to a warming climate. The freezing point of water becomes a tipping point for many physical, chemical and biological processes in these cold regions. As the soil thaws, microbes break down organic matter that has been frozen in permafrost for hundreds, if not thousands, of years and release carbon dioxide and methane into the atmosphere. We started in Utqiagvik, on the north slope of the Alaskan coast where soil temperatures year-round are minus 20°F or colder. Then we added Nome, which is located on the west coast just within the Arctic Circle and has a warmer climate. Soils and permafrost there are right at the freezing point, which makes for a much more dynamic landscape. These sites give us two ends of a continuum of very cold to warm permafrost that we can compare and contrast, studying environmental processes along temperature and latitudinal gradients. That gives us a lot of power in trying to understand not only current ecosystem processes, but also what ecosystems might look like in the future. What are the toughest challenges you face? Early in the project, we had a steep learning curve. Most of us had never worked in the Arctic before, and our partners at the University of Alaska–Fairbanks were instrumental in helping us establish protocols for working safely and productively in these cold, remote landscapes. They also helped us establish key relationships with the native corporations that own the lands we study. You have to be really prepared and develop your work plans ahead of time. You have to make sure that when you hop out of your vehicle, or off the snow machine, or off the helicopter into a hoard of mosquitos or temperatures that can dip below minus 20°F, you have everything you need for that day, because you’re not going to get a second chance to run to the store to grab something you forgot. Did anything in this project surprise you? microbial production of carbon dioxide and methane. But as it turns out, all of those processes are coupled and interconnected; and because of that, we’ve changed how we study the system. We had to rethink our experimental approach, how we collect data, how we interact as a team, and then how we bring all of that data together for models. It’s been a great experience for all the members of our team—students to senior scientists— and this integrated approach enriches the scientific outcomes.